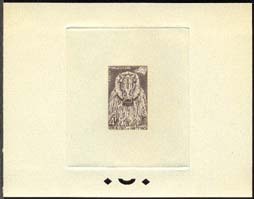 18645 EA UPPER VOLTA (1960a2) Deer Mask*. Sepia printer's proof. Scott No 73, Yvert No 73. These are the rarest of the French proofs. Only 3-4 were made from the unhardened die as a final check before printing. 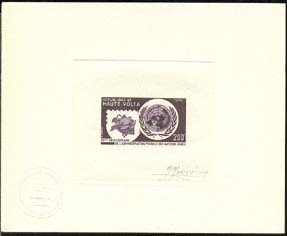 18646 EA UPPER VOLTA (1960b) Warthog Mask*. Sepia printer's proof. Scott No 76, Yvert No 76. 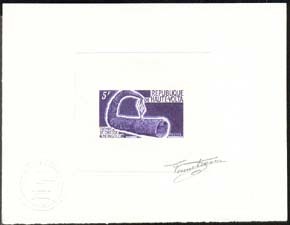 These are the rarest of the French proofs. Only 3-4 were made from the unhardened die as a final check before printing. 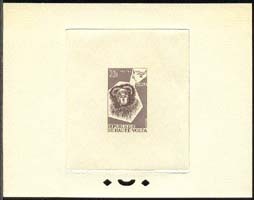 18647 EA UPPER VOLTA (1960c2) Monkey Mask*. Sepia printer's proof. Scott No 78, Yvert No 78. These are the rarest of the French proofs. Only 3-4 were made from the unhardened die as a final check before printing. 18648 EA UPPER VOLTA (1960d) Buffalo Mask*. Sepia printer's proof. Scott No 82, Yvert No 82. These are the rarest of the French proofs. Only 3-4 were made from the unhardened die as a final check before printing. 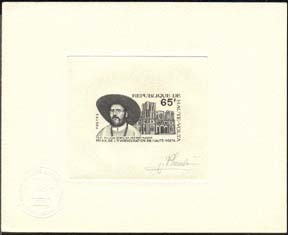 18649 EA UPPER VOLTA (1960e) Coba mask*. 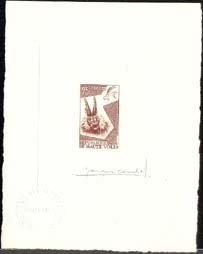 Die proof in brownish-violet signed by the engraver COMBET. Scott No 83, Yvert No 83. 27 EA UPPER VOLTA (1962) D'Arly Reservation*. 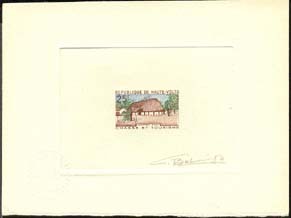 Die proof in color signed by the engraver BETEMPS. Scott No 100, Yvert No 100. 9933 EA UPPER VOLTA (1965) Churchill*. 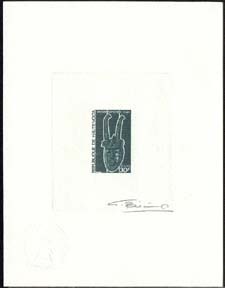 Die proof in black signed by the artist LAMBERT and the engraver MAZELIN. Scott No C32, Yvert No PA32. 10692 EA UPPER VOLTA (1965) Earth*. Sun*. Die proof in black signed by the engraver GAUTHIER. World Meteorological Day. Scott No C21, Yvert No PA21. Only 28 exist. Rare! 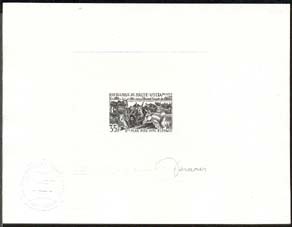 5688 EA UPPER VOLTA (1966) UNESCO emblem*. 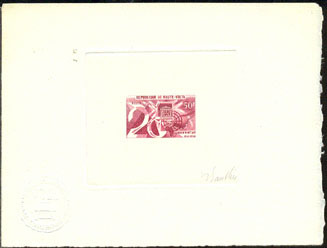 Die proof in reddish-violet on watermarked paper (rare) signed by the engraver GAUTHIER. 20th anniversary. Scott No 173, Yvert No 175. 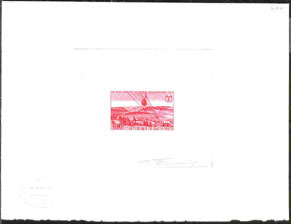 5689 EA UPPER VOLTA (1966) UNESCO emblem*. Children*. 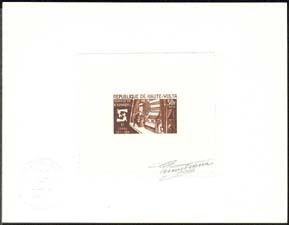 Die proof in black on watermarked paper (rare) signed by the engraver GAUTHIER. 20th anniversary. Scott No 174, Yvert No 174. 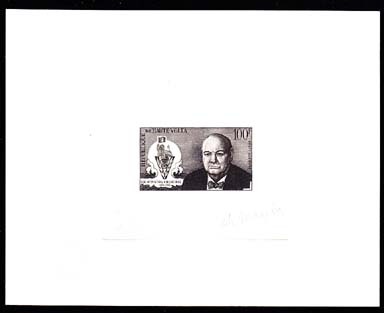 10990 EA UPPER VOLTA (1966) Pope Paul VI*. Dove*. 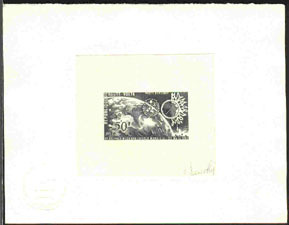 Die proof in black signed by the artist LAMBERT and the engraver MAZELIN. Appeal for peace at the UN. Scott No C33, Yvert No PA33. 9603 EA UPPER VOLTA (1967) Ashanti Gold Token*. Die proof in violet signed by the engraver HANNIQUET. African Monetary Union. Scott No 181, Yvert No 183. 17478 EA UPPER VOLTA (1967) Ski lift*. 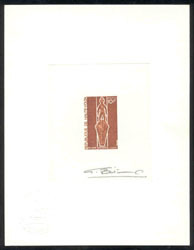 Die proof in red signed by the engraver BETEMPS. Grenoble Olympics. Scott No 184, Yvert No 186. 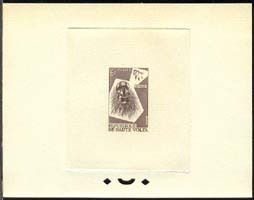 2691 EA UPPER VOLTA (1968) Weaver*. 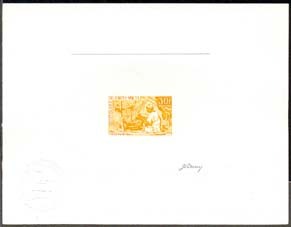 Die proof in orange signed by the engraver DERREY. Scott No 191, Yvert No 194. 2692 EA UPPER VOLTA (1969) Automatic Looms*. ILO emblem*. 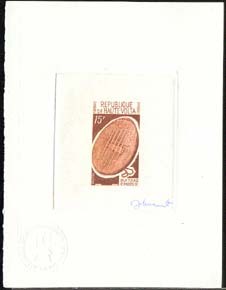 Die proof in dark brown signed by the engraver FENNETEAUX. 50th anniversary of ILO. Scott No 193, Yvert No 196. 2723 EA UPPER VOLTA (1969) Smith*. Tiny metal figurines*. 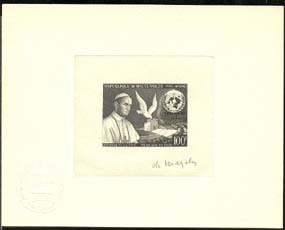 Die proof in grey signed by the engraver PHEULPIN. Scott No 194, Yvert No 193. 18979 EA UPPER VOLTA (1969) Hausa Warrior*. Dancers*. Musicians*. 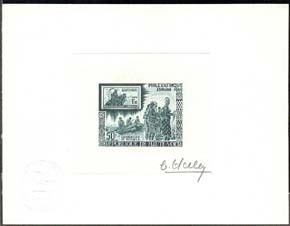 Die proof in green signed by the engraver HALEY. 2nd PHILEXAFRIQUE Exhibition. Scott No C62, Yvert No PA63. 3382 EA UPPER VOLTA (1970b) Old and New Citroens*. Die proof in black signed by the engraver GANDON. Scott No 232, Yvert No 230. 10579 EA UPPER VOLTA (1970) Niadale mask*. Scott No 207. Yvert No 207. 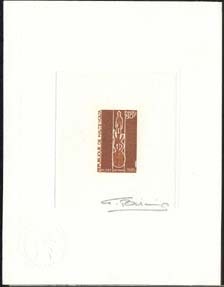 Die Proof in brown signed by the engraver BETEMPS. 18235 EA UPPER VOLTA (1970) Illu Bara Carving of man * woman*. Die proof in brown signed by the engraver BETEMPS. Scott No 209, Yvert No 209. 18236 EA UPPER VOLTA (1970) Karan Weeba figurine*. Die proof in dark brown signed by the engraver BETEMPS. Scott No 210, Yvert No 210. 18660 EA UPPER VOLTA (1970) Niaga mask*. Die proof in dark green signed by the engraver BETEMPS. Scott No 208, Yvert No 208. 18750 EA UPPER VOLTA (1971c) Beingolo Hunting Horn*. 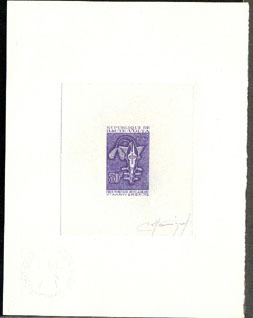 Die proof in violet signed by the engraver FENNETEAUX. Scott No 236, Yvert No 234. 18752 EA UPPER VOLTA (1971d) Mossi guitar*. 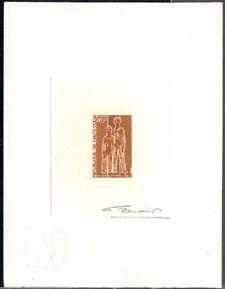 Die proof in brown signed by the engraver MIERMONT. Scott No 237, Yvert No 235. 18753 EA UPPER VOLTA (1971e) Gourounsi carved flutes*. 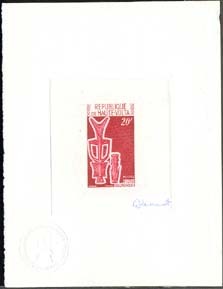 Die proof in red signed by the engraver MIERMONT. Scott No 238, Yvert No 236. 18754 EA UPPER VOLTA (1971f) Lunga drums*. Die proof in brown signed by the engraver JUMELET. Scott No 239, Yvert No 237. 19077 EA UPPER VOLTA (1971) Men of 4 races*. 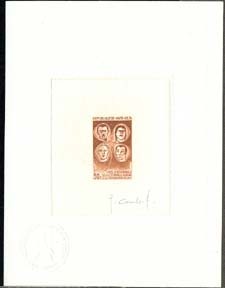 Die proof in brown signed by the engraver COMBET. International Year Against Racial Discrimination. Scott No 240, Yvert No 238. 103 EA UPPER VOLTA (1972) Cattle*. 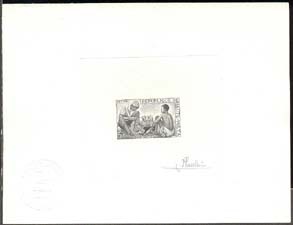 Die proof in black on watermarked paper (rare) signed by the engraver DECARIS. Five Year Plan. Scott No 278, Yvert No 276. 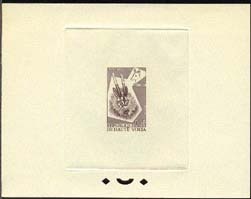 11592 EA UPPER VOLTA (1973) Bird delivering letter*. Satellite dish*. Map of Africa*. 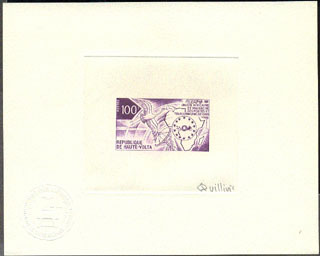 Die proof in violet signed by the engraver QUILLIVIC. Scott No 500, Yvert No 291. Only 28 exist. Rare! 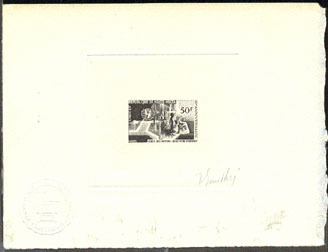 18861 EA UPPER VOLTA (1975) Msgr. Thevenoud*. Cathedral*. Die proof in black signed by the engraver PHEULPIN. 75th anniversary of Evangelization of Upper Volta. Scott No 381, Yvert No 376. 19068 EA UPPER VOLTA (1976) UPU emblem*. UN emblem*. Die proof in violet-black signed by the engraver MONVOISIN. 25th anniversary of UNPA. Scott No 405, Yvert No 395.